Whoa, windfarms in UK operate well below advertised efficiency | Watts Up With That? James Delingpole quips that “Official: wind farms are totally useless” Well, maybe not totally useless (unless he’s talking about the ones in Hawaii from my recent article) but these efficiencies are proof positive that the current wind power technology will never be anything but a small sporadic supplemental power source. in respect of analysis of electricity generation from all the U.K. windfarms which are metered by National Grid, November 2008 to December 2010. The following five statements are common assertions made by both the wind industry and Government representatives and agencies. This Report examines those assertions. 1. Average output from wind was 27.18% of metered capacity in 2009, 21.14% in 2010, and 24.08% between November 2008 and December 2010 inclusive. 2. There were 124 separate occasions from November 2008 till December 2010 when total generation from the windfarms metered by National Grid was less than 20MW. (Average capacity over the period was in excess of 1600MW). 3. The average frequency and duration of a low wind event of 20MW or less between November 2008 and December 2010 was once every 6.38 days for a period of 4.93 hours. 4. At each of the four highest peak demands of 2010 wind output was low being respectively 4.72%, 5.51%, 2.59% and 2.51% of capacity at peak demand. 5. The entire pumped storage hydro capacity in the UK can provide up to 2788MW for only 5 hours then it drops to 1060MW, and finally runs out of water after 22 hours. OTHER FINDINGS have emerged in the course of this analysis in addition to the Principal Findings which related to the testing of five common assertions. These Other Findings are listed below. * below 1.25% capacity for the equivalent of just under one day a month. The discovery that for one third of the time wind output was less than 10% of capacity, and often significantly less than 10%, was an unexpected result of the analysis. 2. Among the 124 days on which generation fell below 20MW were 51 days when generation was 10MW or less. In some ways this is an unimportant statistic because with 20MW or less output the contribution from wind is effectively zero, and a few MW less is neither here nor there. But the very existence of these events and their frequency – on average almost once every 15 days for a period of 4.35 hours – indicates that a major reassessment of the capacity credit of wind power is required. 3. Very low wind events are not confined to periods of high pressure in winter. They can occur at any time of the year. 4. The incidence of high wind and low demand can occur at any time of year. As connected wind capacity increases there will come a point when no more thermal plant can be constrained off to accommodate wind power. In the illustrated 30GW connected wind capacity model with “must-run” thermal generation assumed to be 10GW, this scenario occurs 78 times, or 3 times a month on average. This indicates the requirement for a major reassessment of how much wind capacity can be tolerated by the Grid. 5. The frequency of changes in output of 100MW or more over a five minute period was surprising. There is more work to be done to determine a pattern, but during March 2011, immediately prior to publication of this report, there were six instances of a five minute rise in output in excess of 100MW, the highest being 166MW, and five instances of a five minute drop in output in excess of 100MW, the highest being 148MW. This indicates the requirement for a re-assessment of the potential for increased wind capacity to simulate the instantaneous loss (or gain) of a large thermal plant. 6. The volatility of wind was underlined in the closing days of March 2011 as this Report was being finalised. * Output from wind in March 2011 was 10% of capacity or less for 30.78% of the time. The nature of wind output has been obscured by reliance on “average output” figures. Analysis of hard data from National Grid shows that wind behaves in a quite different manner from that suggested by study of average output derived from the Renewable Obligation Certificates (ROCs) record, or from wind speed records which in themselves are averaged. It is clear from this analysis that wind cannot be relied upon to provide any significant level of generation at any defined time in the future. There is an urgent need to re-evaluate the implications of reliance on wind for any significant proportion of our energy requirement. If only there were decision makers who read and understood this. Think of the amount of capital that has been wasted on this folly. Then add the amount of subsidy that taxpayers throw at the industry. Now add the higher electricity costs that ratepayers have to cover. All that wealth destroyed to benefit an inefficient source of energy. First Ethanol. Then Wind/Solar. Next up “The Pickens Plan” that will use government largesse to generate a market for LNG in vehicles. Another industry (nat gas industry) that will become beholden to Washington and will fight for more subsidies/tariffs/mandates to the death. OK, so even conservationists are now saying it. But none of this is news: everybody who examines the matter finds the same. I have been reporting it for years; see e.g. Relying on averages, as all the “green” wind studies do, is akin to saying that a guy with one foot frozen in a block of ice and the other blistering in glowing embers is doing just fine. Wind farms may operate at less than 10% ecapacity one-third of the time but hey, they’re still 100% efficient in massacring flocks of birds. Perhaps common sense will prevail. I am sick of living in a mad-house. Wow- not that the findings are suprising- any idiot knew this already; but that it is SO damning. Let’s see them spin this one then. This report won’t come as very much of a surprise to anyone who lives in an area of the UK where wind farms are prevalent, for example in West Cumbria (marketed, among other things, as “The Energy Coast”). It’s quite evident that most of the time only a fraction of the turbines are operating. A couple of days ago I found it noteworthy that one fellside wind farm south of the Duddon estuary had all nine turbines turning; normally 50% or fewer are operating. We have been lied to and mislead and deceived about windmill (non)generated electricity and now we have concrete proof. All those years and billions of pounds utterly wasted and based on a series of cynical lies, I feel slightly sick, the waste the sheer bloody waste of it all. Will this change the minds of the self proclaimed “greenest(reddest)ever government”. We have been had, been rolled and scammed and its left a bad taste in the mouth, whats worse is that some people are going to exit the fraud a great deal richer while those least able to weather the consequences will suffer greatly. I hope those people who walked away richer will one day realise what they have done. Our own government ignoring the evidence, hiding the facts, misrepresenting the reality and for what? Even if they scrap the bird manglers all we have to show or those billions of pounds is a few tons of rare earth magnets and a great deal of scrap steel at the scrapyard, its not so much the money but the time wasted on a fantastical fraud, time is precious because our electricity matrix is on its last legs, time lost means when the rolling blackouts come the least able to ride the wave will be the poor and the elderly on limited incomes. Well, this problem is easy to solve – just install 5 times more wind turbines to obtain your original generation capacity! First list of Findings: 3. The average frequency and duration of a low wind event of 20MW or less between November 2008 and December 2010 was once every 6.38 days for a period of 4.93 hours. 2. Among the 124 days on which generation fell below 20MW were 51 days when generation was 10MW or less. In some ways this is an unimportant statistic because with 20MW or less output the contribution from wind is effectively zero, and a few MW less is neither here nor there. But the very existence of these events and their frequency – on average almost once every 15 days for a period of 4.35 hours -indicates that a major reassessment of the capacity credit of wind power is required. Thanks for this item! Good resource for us who are opposing wind farms here in Alberta. Here in southern Alberta the AESO reports that wind farm output averages 30 to 35% of its 777 MW capacity. I recently saw one “real time” report of zero MW and it is common to see output of <10% of capacity. What you will hear from the Green profiteers, amongst them the German renewable energy provider Greenpeace Energy, is that this is not a problem at all; simply store the excess wind energy in “wind gas”, by which they mean H2; derived by electrolysis. Oh, and you will here that we need to force the natural gas pipeline owners to transport this H2 in the gas mix, and that we will need incentives for this new and innovative solution. What you will not hear is a word about the inefficiency of this idea or the fact that H2 would destroy the pipeline network. Before you think i’m making this up here’s the source, in German. Everyone who has tried wind farms has been disappointed. How long before the insanity passes? I second Richard Courtney. Will government take note? Doubt it. Excellent site to view electricity output by fuel source in the UK. An utter waste of money and energy [pun intended] aimed at making the carbon profiteers very rich people indeed. This mad experiment will lead to power outages in mid-winter, excess winter deaths and so on. I vaguely remember that wind turbines require conventional power to turn the blades when there is not enough wind or something like that. No contradiction at all Steve. The 1st refers to 20Mw or less, which by definition must include the 10Mw or less periods which are shorter & less frequent as noted in the 2nd. You remember correctly. If the blades are not turning for protracted periods of time, the bearings and shafts can distort so they must be powered. I have long thought that the abominations should have bi-directional metering and would not be surprised if at least some were nett energy users. Will somebody please bang Cameron’s and Huhne’s heads together and remove their Green blindfolds. Cameron’s credibility amongst party members must be approaching zero. Spend the wind money on Thorium powered devices. A waste product of producing wind turbine magnets is a massive, toxic lake in China. Extra! Extra! Read all about it. Just how really green is winpower? So green it’s known as the bird chopping eyesore. Sadly, all major political parties spout the official AGW line and bleat about the ‘need’ for renewable energy sources. Solar panels obviously don’t cut it in the UK, except for a few weeks in July and August every second or third year. So now the UK economy is rushing headlong into a future of brown outs and blackouts and/or hideously expensive electrical power, reliant on unreliable, expensive wind machines. The signs are now officially up for foreign and domestic investors in industrial projects to keep well away from the UK, as there will be insufficient electricity for their needs. If windmills were re-tasked, with the chore of disassociating hydrogen from water, many of it’s apparent flaws, would be moot. This was predicted by anyone who actually took a look at the numbers. We always knew it, but we are really learning how costly ignorance, especially willful ignorance, actually is. The greens have a lot to answer for. Rocky Mountain Power has a “Flyer” on wind power. When describing wind power, the common phrase is “generation capability”. It is silent on delivered generation output. The following quote indicates the real incentive for the program. Next time, you may want to hire a real engineer. This needs to be repeated. Over and over again. I’ve been saying just that about solar for years. And on the subject of entropy – G. Karst, you might want to check out the laws of thermodynamics. Your proposal would be even LESS efficient. And Solar power is worse !! The response to this can only be emotional. ROMM and Hansen say we don’t care about our grand children if we slander the wind industry. You don’t have to worry about this issue as the UK government plans to have shut down the majority of industry thus supplying a veritable surplus of manpower to stand in front of the windfarms and blow. The fishing industry will be usefully employed for the off shore windfarms backed up by the redundant sailors from Her Majestys Royal Navy. I would normally type ‘/sarc’ at this point but those from the UK will appreciate the reasons not to. The real clue to wind farm profitability and efficiency came when T. Boone Pickens pulled the plug on his grandiose scheme. That’s all I needed to know! The problem is that those days occur when an anti-cyclone sits over the UK. When that occurs during the winter months they are the coldest days of the winter, with the consequent maximum demand on the grid. Well, not exactly. Their 20% load factor would still be present and what exactly would be accomplished by the hydrogen produced? Hydrogen usage would only be effective in a usage scenario that doesn’t exist. If hydrogen is the target, it would appear that off-peak nukes would be a much more efficient and economical means of production. Analysis of hard data from National Grid shows that wind behaves in a quite different manner from that suggested by study of average output derived from the Renewable Obligation Certificates (ROCs) record, or from wind speed records which in themselves are averaged. If our politicians were anything but well below average, they might realise that an average is just a number, not reality. In other breaking news, scientists report that water is wet, the sky is blue, and politicians buy votes with taxpayer money. The sad thing is, Frank, that’s the plan. Whirlygigs and pinwheels. I blame the utility industry for their abject failure to educate the public on the issues of wind energy. It was always a farce and never seriously considered a replacement for traditional sources of energy. We (in the utility industry) knew this from the start. We didn’t speak up on behalf of the public. Mother Gaia, does NOT do averages; neither average Temperatures, nor average wind speeds. She knows what the Temperature is everywhere all the time, and she knows what the wind speed is, and she never lets go of any excess of either to make room for a dearth of either, at some other time. Both Temperature and Wind Speed are non linear functions of energy (in either order); so what is the point of computing averages; which are as I have often said, about as useful as the average telephone number in the Manhattan Phone directory; or the average number of animals (larger than a flea) per hectare, on earth ! Between Jan and Feb 2010, the UK had no wind for six weeks. You cannot run a 24/7 technological societyon an electrical supply that disappears for six weeks. Even more farsical, is the fact that Denmark, Europe’s largest wind power generator, has never used any of its wind power. Its large variability would overwhealm their small grid. It sells the electricity to Scandinavia instead (at a huge financial loss), who can instantly throttle up and down their large hydro generation plants. If this wasn’t known before it should have been known from the time of the Wright Brothers. They went to the Outer Banks of North Carolina because the average wind speed was 15kts which is perfect for flying, the problem was that often it blows much harder or much less than average. Now of course they did finally get off the ground, but they had a lot of delays due to poor wind conditions. If you consider a wind fan to be just the turbine part of a gas turbine, requiring a mass of working fluid (air), and an input duct (big valley) to bring the working fluid to the turbine; and an output duct, to allow egress of the spent working fluid (exhaus gas) (nother big valley), and a fuel to provide heat energy to the working fluid (the sun), you can appreciate that these things are simply huge in size. Just imagine what the Temperature drop is for the working fluid going through the turbine, and guess what the Carnot efficiency might be. 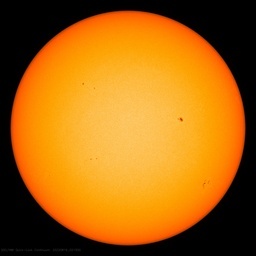 Well yes I know that you have a near infinite amount of solar energy to waste; but think of the wasted space. So the propellor only takes a quarter of an acre; or is it up to maybe an acre now with these 5 MW monsters. Well it you really want to just consider the business end of things, and not the whole installation, you should calculate what the available power density is coming out of a standard 20 Amp or even a 15 amp three prong wall socket. 15 Amps at say 120 Volts, is 1.8 KW coming out of about 15 square cm; now there is a real power source; I get about 1.2 MW/square metre. That’s 1200 times the ground level sun power. Well yes I know that behind the curtain there is this humungous big power distribution network; but if you aren’t going to consider ALL of the real estate that s running your windmill fan, why should I worry about what’s behind my 15 Amp plug ! The BBC doing an anti-Green article. Let me think aout this for a minute…..
Methinks there may be levers being pulled by the government here. There were all on track to replace all the UKs nuclear power stations with new nuclear plants – and then the Japanese disaster happened and more than a few ministers started to waver and cry that we needed more windelecs. Is this a shot across the bows of the waverers? trying to use low grade windpoeert to disassociate H2O is dumb. It would be much better to simply run desalinization plants and pump the water into the ground to replenish the Aquifers. All the Environmental Eco-chondriacs in the California Coastal cities could dot their seacoast with such nonsensical “Gaia saving” activities. They could see the “profits” to finance more and more desalinization. After all, why import water from Colorado to feed San Francisco and Los Angeles sitting by the Sea? Wouldn’t it be better for the neo-Druidic Gaians to achieve yet another desirable eco-warrior aim? We could leave electric generation to qualified people, instead of these politically correct, ignorant and stupid imbeciles. If the blades are not turning for protracted periods of time, the bearings and shafts can distort so they must be powered. I have long thought that the abominations should have bi-directional metering and would not be surprised if at least some were nett energy users. I doubt that they just have a single meter showing their net contribution to the grid. Every watt they generate will be metered, contributed to the grid, and charged for at the higher “green” tariff. Every watt they consume will be bought from the grid at the lower wholesale tariff. This means that would be less profitable for them to use their own energy. UPDATE, April 6: This article has elicited a considerable amount of interest, and some criticism. We always welcome discussions of the stories we publish. Some readers felt the original headline (Wind and wave energies are not renewable after all) was misleading, so to address these concerns we have changed it. We have also been made aware of a wider debate about Kleidon’s research that we did not address in the original article: we will continue to follow this issue and report back on what we find. At present, humans use only about 1 part in 10,000 of the total energy that comes to Earth from the sun. But this ratio is misleading, Kleidon says. Instead, we should be looking at how much useful energy – called “free” energy in the parlance of thermodynamics – is available from the global system, and our impact on that. Of the 47 TW of energy that we use, about 17 TW comes from burning fossil fuels. So to replace this, we would need to build enough sustainable energy installations to generate at least 17 TW. And because no technology can ever be perfectly efficient, some of the free energy harnessed by wind and wave generators will be lost as heat. So by setting up wind and wave farms, we convert part of the sun’s useful energy into unusable heat. “Large-scale exploitation of wind energy will inevitably leave an imprint in the atmosphere,” says Kleidon. “Because we use so much free energy, and more every year, we’ll deplete the reservoir of energy.” He says this would probably show up first in wind farms themselves, where the gains expected from massive facilities just won’t pan out as the energy of the Earth system is depleted. Although the winds will not die, sucking that much energy out of the atmosphere in Kleidon’s model changed precipitation, turbulence and the amount of solar radiation reaching the Earth’s surface. The magnitude of the changes was comparable to the changes to the climate caused by doubling atmospheric concentrations of carbon dioxide (Earth System Dynamics, DOI: 10.5194/esd-2-1-2011). The Sun provides the energy, and there’s only so much of it we can harvest without causing serious disruptions, with an additional problem being the converting of the energy into low grade heat. For “News You Can Use” from New Scientist, for a change, researchers have discovered a helpful new treatment for Restless Leg Syndrome, well worth trying. Offshore wind will do better. So will high altitude wind. So long as the money is being lost by private developers when their output is lower than expected, I don’t mind. And it looks like storage is becoming practical. An electric generation magazine (Power Mag) recently discussed their top 5 energy storage options. It sounds like 80% round trip efficiency storing electrical energy at a utility scale is becoming practical. Also, technologies to fix CO2 into liquid carbon fuels are on the list. MUCH more important is the fact the the bBBC actually permitted an ‘anti-green’ article to be presented on prime time TV. The bBBC has a pro-AGW agenda that is increasingly frantic in the face of the onslaught of evidence that is destroying the ’cause’. For this article to even get past the ‘censors’ is amazing in its own right! Could we *finally* be seeing the turn? is blowin’ in the wind. YIKES!!! It’s an ‘answer’ we can not rely on or afford! Thanks for the update, Anthony and contributors! This is more useful information to educate my spineless state Representatives and Senators with. I promise it will be put to good use! Next up “The Pickens Plan” that will use government largesse to generate a market for LNG in vehicles. Suspect it will be the “Chevy Volt” that will get the government largess. “Washington – President Barack Obama announced today that the U.S. government will buy only advanced technology vehicles — such as hybrids and electric plug-ins — by 2015. RockyRoad – why ‘farm’ at all – it should be wind factory. It’s all to do with ‘spin’ not the windmill type of spin but the word type. ‘s-a-wonder they didn’t go all loverly and call them wind gardens. I may be missing the point here.But would it not be possible to use the power from the wind genorators to power the pumps of the hydro storage facilitys? Holy smokes! Its a lot worse than we thought! Possibly even a travesty! In the UK the high priest of wind power is Dale Vince. He’s an old hippy who lives near my local town where his company, ecotricity, is headquartered. I do hope he gets to see this report. I also feel a letter to my MP coming on, after all, he is supposed to be a policy maker. Governments must take their heads out of the sand and out of taxpayer’s pockets. Wind power is an expensive problematic experiment that is doomed to failure. Foreign and domestic investors in industrial projects that require a reliable, cost efficient/reasonable price energy source needed to power industry or business ventures to make them price competitive, will steer well away from the UK and any other Country, State or Provinces (Many come to mind) that don’t control energy costs. Wind power promises don’t live up to the sales marketing hype, as proven over and over again. Wind power will guarantee is there will be insufficient electricity for their needs and at a high cost. Not an attractive prospect for end user industry’s, businesses or the average electricity consumers. Energy salvation and energy poverty will be and are becoming the new reality with more and more frequency. Same conclusion they reached in the early 1800’s when watergas production to be used in steam engines was pushing out windfarms at that time. The wind was far too sporadic. Either not enough or none at all especially when you really needed it. If you’re so sure of that. I challenge you to find Usage v Production figures. I’ve tried & even a friend in the generating business couldn’t find figures. Ops. Moderator please see and correct mistake at bottom should read Energy STARVATION not Salvation. Thanks. Energy STARVATION and energy poverty will be and are becoming the new reality with more and more frequency. They don’t produce enough energy kill anyone – until the blades fall off. It’s a truly amazing performance! I especially like the part with the picture of asthmatic children sucking air through a tube because of “carbon” pollution. If you’re so sure of that. I challenge you to find Usage v Production figures. There is little chance of obtaining that. My confidence comes from the fact that they are a business. If £y is greater than £x then they will not use the electricity they generate. They will instead buy anything they need from the grid since this generates the most profit. Due to the subsidies feed in tariffs £y is currently greater than £x so they will not use their own energy. “Yet again the John Muir Trust has commissioned an anti-wind farm campaigner to produce a report about UK onshore wind energy output. “Industry, government and regulators all agree that a growing mix of renewables on the system is the answer to affordable, secure, sustainable energy. Note to Ms. Hogan: I agree. Companies like these do indeed choose to invest (here) in Scotland, and elsewhere throughout the UK, but not because their products offer a stable, reliable, cost-effective or desirable form of electricity production. Nope. It’s because the UK and all devolved national governments actively court them with open arms and guaranteed tax-payer’s £billions, because it fits the pervasive ‘green’ narrative, now conveniently adopted as some sort of proud world-leading initiative, ultimately just in the nick of time to save us all from imminent climatic disaster and it strengthens the ever-increasing yolk between government dictat and individual freedoms. Maybe this is where Chris Huhne’s 100,000 green jobs will be – the wind turbines will be connected to a network of exercise bikes with heavy-duty dynamos, with each bike being pedalled by one of those lucky 100,000 ‘green’ employees. Thanks Dave, but I just can’t anymore. The fact that Mz. Boxer is a stunningly stupid person should be known to all Americans by now. And the fact that Californians continues to inflict that mass of stupidity caused morass on the rest of the nation shouldn’t be lost either. And she’s not the only massively stupid person they inflict upon us. What does it say towards the average Cali voter? I’ve watched in disbelief at the amazing stupidity of our politicians and leaders for too long. I’m no longer disgusted with their willful ignorance, but rather disgusted by many of my fellow countrymen and women. It is of small comfort to know that other nations are plagued with the same massive stupidity of allowing the ignorant to lead the nations of this world. And, it isn’t just coming from one party either. Recently, the repubs have moved to overturn the law banning production of the incandescent light bulbs. That’s great. Perhaps they didn’t notice the last incandescent light bulb production plant in the U.S. closed already. Any production plant left in the U.S. would be fitted for CFLs or LED’s. So, if they were to overturn the law, this would ensure any incandescent light bulb purchased would be produced over seas.—–to the continued detriment of U.S. industry and trade balance. I think they’re trying to out-stupid the other party. But, I don’t think they’re dumb enough to pull it off. But, I also know that in the past, I’ve often misjudged their depths of stupidity, so I could be wrong again. In a sane world the media would be harrying these politicians over this at every turn. On every tv interview they would be skewered with these facts. Every time Huhne or Cameron is taking questions they would be demanded to explain the contradictions in their policies. Every newspaper would be letting loose their attack dogs. Documentaries exposing the madness would be airing weekly on tv. The scoundrels would be hounded out of office. I analyzed the 1993 Embodied Energy Analysis for the Livermore Pass CA wind facility, which claimed an EROEI of 14.87, and showed the true EROEI was 0.29. On 02-21-09, the http://www.windpower.org web site claimed that wind power pays for itself in 2 to 3 months. My subsequent analysis showed that the payback was really 130 years. This web site has since gone from English to Dutch and the claim has – rightly so – evaporated. When discussing wind power, it is critical to ask the burning question on any proposed wind power facility: What is it’s EROEI? It’s easy for a windmill to store energy. Just attach a large rubber band. When the windmill generates more power than is demanded, use the excess power to wind the rubber band. Full disclosure note. I’m heavily invested in a company that makes rubber bands. Our latest model, the “stretch 1000” can store 1000 Joules of energy; and from a fully wound state, unwinds in 10 seconds. That’s 100 watts for 10 seconds. We’re making billions–both rubber bands and dollars. When all you TV Zombies have to wake up when the haunted fish tank goes dead, stupified from years of XFactorDancingOnIcePopIdolFootballLottoCelebShagMania, and you come ’round MY house jonesing for a bowl of hot stew … press the doorbell marked GFYS! This graph shows the yearly averaged actual energy production of wind power in Germany (black line) and the forecast production (orange line). Not even once since this data set starts in 1993 has the actual production reached the forecast production. The text above the graph states in German “below average wind years have so far prevented wind power from reaching its full potential”. Meaning there has not been an “average” wind year since 1993??? Only a mathematically illiterate politician can believe that. Designing the perfect source of dependable power…. 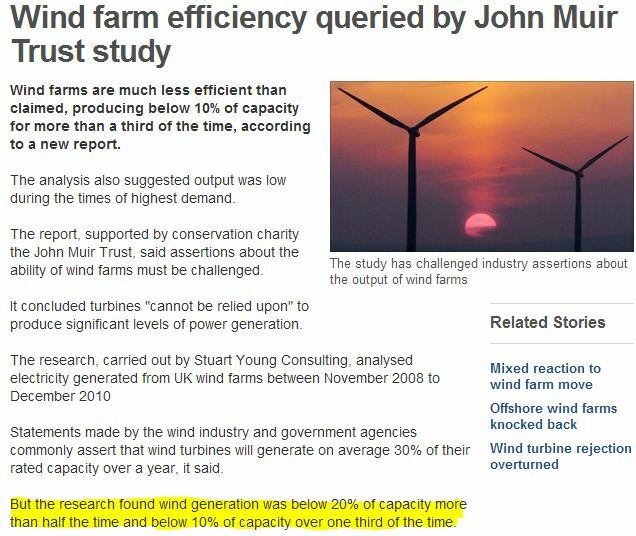 As far as I can tell, the full report commissioned by the John Muir Trust blames the shortfall in generating capacity almost entirely on the intermittence of wind (e.g., “low wind events”.) However, Anthony has posted evidence that non-functioning turbines may be a huge factor if the 1 in 4 ratio of “dead” turbines he observed in California is typical of the industry. As far as I can tell, this factor is not mentioned anywhere in the Muir report. Maybe someone should send them a copy of Anthony’s post. This raises a related question. The report based its results on a comparison to the 30% generation capacity used as a “constant” by the industry. How was that percentage calculated? Does it include an allowance for non-functioning turbines? Probably, but is it high enough? I did a quick Google search on windfarms and the 30% capacity constant and found no mention of such an allowance. If Anthony’s observed ratio of non-functioning turbines is typical, the constant may be too high. It looks like they’re slowly depleting the wind in Germany. That’s good. It’s too windy here in Northern Germany anyway. So they’re good for something, at last. And now even the Europeans are agreeing that the entire wind power supply system can drop out over large areas. Pöyry says that while improved interconnectivity between countries could help protect supply and provide support to regions that are facing shortages, often multiple countries across Europe experience similar weather patterns and so several could face shortages at the same time. Better interconnections in isolation would therefore not be an effective solution. Funny thing that — just like the Ontario, Canada wind power system. Click on my name — look at section 3.1 in the table of Contents — Powering Ontario. Industrial Wind Turbines are a waste of money! “Pitching the promise of energy independence, President Barack Obama cautioned Wednesday that it’s going to be tough to transition from America’s oil-dependent economy and acknowledged there’s little he can do to lower gas prices over the short term. “I’m just going to be honest with you. There’s not much we can do next week or two weeks from now,” the president told workers at a wind turbine plant. It’s a theme Obama’s struck before as he tries to show voters he’s attuned to a top economic concern with gas prices pushing toward $4 a gallon. How many of these ………wind power is the future….. types have noticed the number of windmills in Dutch paintings from the 17th century? How many farms and ranches in 18th and 19th century America had a windmill? Yes, Obama once again made a fool out of himself today. Not only did he hype wind energy but the company he visited is a foreign owned company. Yes, a decrease in efficiency, however a stockable inventory and “point of use” adds to overall efficiency. It enables wind power transportation without the restrictions of sails. Hence the advantage of choosing hydrogen production instead of MWe. Hydrogen is easily bottled. Yes, exactly so, I think all generators should run flat out. Grid voltage can be maintained/regulated by dumping surplus MWe into electrolysis. This would be ideal. Today I gave a lecture on medieval water and wind mills to first year students. I linked these technologies to our modern energy-dependent society, with images of modern electricity-generating turbines and wind turbines. I also discussed the unreliability of wind power. My last slide showed five images of burning, blown-out or collapsed wind turbines. I should have had a camera to record the utter shock on my students’ faces. Hey, if Obama manages to blow away another massive chunk of America’s wealth, that of the present to three generations hence, and afterwards we have a pile of recyclable steel, copper, and some aluminum that’s worth perhaps one-thousandth of the original cost, it’ll be an improvement. Agreed. And my point was that given the installed cost and O&M requirements of even the latest wind turbines, with a 20-24% load factor, that would be an uneconomical source of H2 compared to the use of off-peak Nukes, run-of-river hydro, and (yes, even) coal and gas-fired generation. If the current “windfarms” are producing below 30% and assuming the “better” sites are those being installed initially, then the more marginal sites will certainly produce at a lower load factor. Have to wait and see when (if) offshore sites are developed, if their supposed better load curves can off-set their increased costs and O&M. And I haven’t even gotten to the (presently hidden) added costs of all the added transmission and substations required to add these big fans to the grid. Maybe. But it is not easy to keep bottled. Earlier in this thread someone suggested mixing the hydrogen with natural gas and using the natural gas pipline system. H2 is a very much smaller molecule than CH4. Fittings that are natural gas tight are not necessarily hydrogen tight. Much of the hydrogen will leak out the system. I had personal experience with this a number of years ago working at a pipeline compressor test facility that used nitrogen and helium to simulate natural gas for safety reasons. The helium (which while a small molecule, is still larger than hydrogen) would continually leak out of the system (but not the nitrogen), dispite our best efforts. Natural gas piping and fittings are not designed to contain molecules as small as H2. >>Suspect it will be the “Chevy Volt” that will get the government largess. I hope not. Electric cars pump out more emissions and CO2 than a standard European diesel. There are too many losses in the electrical cycle – and from where does the car get its elecricity! Hmmm, yes, from coal, oil or gas. There’s nothing new in this report to anyone that has the minimum knowledge of Wind energy. On energy matters, WUWT seems to have befriended its algorian nemesis in the support for Gas and other fossil fuels. In 5 to 6 years the UK grid shall become permanently intermittent due to lack of Gas imposed by the decline in the North Sea. I wonder what will WUWT be writing about by then. The claim that large arrays will negate the variation of wind strength has been blown out of the water in Australia where one wind farm complex is 1000km across but still fails to produce power most of the time. As far as UK turbine efficiency is concerned I was told during an alternative power teach-in that 20% was about right for wind turbine efficiency. So a 1Mw turbine will produce 200Kw. So we have to multiple all government quoted turbine numbers by 5 to get the correct result. This suggests to me that finding less than 20% of output for more half the time wasn’t unexpected. I would bet it is news to the politicians and proponents of wind power. The findings also highlight in no uncertain terms the variability of wind. The average, expected output is all but irrelevant to our daily lives – if there is no wind now there is no output and we would get nothing done. That is no way to run a first world country. “I’m just going to be honest with you.” (quoting Barky Oblasmo (sic)). When a politician says this, run like hell. Has anyone forwarded this to the British Secretary of State for Energy and Climate Change, Chris Huhne? He must surely soon start acting with common sense and responsibility and get rid of the silly notion that wind power is going to be the saviour of our forthcoming energy crisis. The variability alone is enough to kill the idea, IMO. 5 min of outage (or, for that matter, large surge of output) is not just an inconvenience: it’s fatal to the Grid, not to mention many of the users. When will a study be done like this in the US? ‘However, Jenny Hogan, director of policy for Scottish Renewables, said no form of electricity worked at 100% capacity, 100% of the time. She said: “Yet again the John Muir Trust has commissioned an anti-wind farm campaigner to produce a report about UK onshore wind energy output. “It could be argued the trust is acting irresponsibly given their expertise lies in protecting our wild lands and yet they seem to be going to great lengths to undermine renewable energy which is widely recognised as one of the biggest solutions to tackling climate change – the single biggest threat to our natural heritage. Yes, it could be argued that they are acting irresponsibly, if you think that saying the Emperor has no clothes is irresponsible . . .
April 6, 2011 at 12:09 pm….. Thanks for the reference. It’s either brown outs, lots of energy storage, or spinning fossil fuel plants as the % of variable renewables come on line. We were told that if we only hooked up all these wind farms to the grid, we would be able to generate electric power from this renewable source. It would be expensive, yes, but worth the price. Now someone comes along, and says, well actually, you also need to buy all this extra stuff at huge cost, because the wind farms can’t power the grid. You need to make hydrogen and bottle it. I say, this wasn’t the deal. This is the classic bait and switch scam. Get the customer to fork out for a system that doesn’t do what was claimed, and then get them to invest even more. Simply to save sunk costs, the poor customer is left to hand over still more dough to the scamsters. I say, on yer bike! (…) In 5 to 6 years the UK grid shall become permanently intermittent due to lack of Gas imposed by the decline in the North Sea. I wonder what will WUWT be writing about by then. Barge-gate, where after a “hacker” releases the real electricity generation info for the offshore turbines, it’s noticed some are supplying 24/7 at times when the winds had been calm for days, and it’s discovered their locations are being used as grid access points for electricity supplied by small Chinese modular nuclear plants stationed on barges (thus technically not on UK soil thus not needing regulator approval and ducking public approval). I certainly won’t argue with an old engineer. They know what they are talking about. Hydrogen in it’s ionized state are merely swimming protons. They can migrate through all containments. H2 is much better, but still extremely problematic. I agree, natural gas can transport in a hydrogen designed system, but hydrogen cannot transport in a natural gas designed system. During my various careers, I have witnessed about a dozen accidental H2 detonations. I was inside one of them (completely unscathed). Old style, on-line gas chromatography instrumentation was a constant hazard. Having said that, I have also witnessed Circuit Breakers explode, Air Compressors heads explode, Coal mills and pulverizers explode. If one has been around long enough, one gets to see almost everything explode. Energy extraction is a hazardous enterprise, no matter the method. I think we are all in agreement, that the present utilization of wind power is badly implemented. Point of use generation is it’s main virtue, and this is completely nullified under the present model. If one has to transmit windmill product, either gas or electrical, it’s viability, disappears. Without a storage capability, it is not even viable as point of use. If UK politicians were so keen on windpower, I would expect to see one of the massive new turbines due to be installed in the London Array (mouth of the Thames actually), installed on College Green outside the Houses of Parliament (where all the interviews by the media are done). Cat in hell’s chance..? Why, exactly..?? Nearly every company or corporation will do trial studies before launching into some new effort. It is just economically unfeasible to go into anything without good justification. I get the feeling that, as far as wind power is concerned, there were no trial studies. Nobody set up a device to measure and record the wind speed for over a year in anyplace where they put windmills. I think someone just drove out somewhere, got out of the car, and said “Gee, the wind is blowing here right now. Good place to put some windmills.” I probably put more thought into where I plant my strawberries. Pumped storage hydro is a funny one too… Because the second law of thermodynamics makes it particularly unattractive. As the pumps used to lift the water up into the reservoir are say 80% efficient (possible with new, large pumps), and the turbines are 80% efficient (possible), then the combined energy efficiency of the system is 64%. Which means 36% of the “energy” you produced is lost as low grade heat. That makes a lot of sense. Sorry, but your “feeling” is mistaken. They did do wind measurements but not the right ones. This is addressed in the Muir Report and it is why many commentators in this thread have mentioned that using averages is an error. Importantly, the effect of strong winds is often overlooked. Wind turbines operate when the wind is strong enough and not too strong. People understand that no wind means no power, but many do not know that high wind means the wind turbines are furled so they then provide no power. This need to provide no power in high winds derives from two factors: i.e. the tip speed of a wind turbine must not go supersonic. A wind turbine starts to provide power when the wind starts to blow strong enough . Then, as the windspeed increases the turbine’s blades are partly furled so they extract a lesser proportion of the available power. The degree of furling is increased as the wind speed increases until the blades are completely furled and the turbine ceases to provide power. A large safety factor is needed for when the turbine will stop providing power at high wind speeds. This is because at high wind speed a gust of slightly higher wind speed has a lot more power. This large amount of extra power from a slightly higher wind speed is because the power of the wind is proportional to the cube of the wind speed. If you are not technically minded then you can jump over the next bit and go down to ***. Wind is the movement of air. Perpendicular to the wind direction, the wind’s kinetic energy per unit time (ek) is provided by the mass (m) and the square of the velocity (v) of the air with density (ρ) moving through a unit area (A). If the turbine were not furled then as the wind speed increased the turbine would spin faster and collect more energy from the wind. But the speed of the tips of the turbine’s blades increases as the turbine spins faster. And, importantly, at high wind speed a small gust is a lot of extra power (because ek is proportional to v^3). So, a small gust would spin the turbine much faster. And this must not be allowed to happen. Wind turbines are big. They do not need to spin at a high rate for the tips of their blades to be moving very fast. And if the speed of those tips breaks the sound barrier the resulting stresses on the blades would destroy the turbine (failures of this kind have happened). So, a turbine operates when the wind is sufficiently strong but not too strong. This provides a range of wind speeds in which a wind turbine operates. And the proportion of time the wind stays in that range during a year defines the output of the turbine (assuming no downtime for maintenance). The proportion of time that the wind is above a certain level and the average wind speed do not provide the relevant information: i.e. they do not indicate the proportion of time that the wind speed is within the range of wind speeds at which the turbine can operate. I hope this is helpful and explains the matter with sufficient clarity. Re your comment at April 7, 2011 at 4:10 pm, pumped storeage does make a lot of sense. The need for power stations to operate is reduced by use of ‘pumped storage’. Electricity is used to pump water uphill to a reservoir when there is little demand from the grid. Then, when there is peak demand for electricity the water is allowed to flow back down and generate power. As you say, this consumes electricity because of mechanical losses, but it is economic because it removes the need for a few power stations to operate almost continuously on standby mode so they can supply electricity at the (very short) times of peak demand. The pumped storage provides the extra electricity needed to meet the peak demand. Conventional (i.e. thermal) power stations fission a material or burn a fuel to obtain heat that is used to boil water and to superheat the resulting steam which is fed to the steam turbines (some power stations – e.g. combined cycle gas turbine: CCGT – also use gas turbines in combination with steam turbines). The turbines drive turbogenerators that make electricity. A thermal power station takes days to start producing electricity from a cold start. Time is needed to boil the water, to superheat the steam, to warm all the components of the power station, and to spin the turbogenerators up to operating speed. Anybody who has boiled a kettle knows that will take time, and a power station takes days to start up. So, ‘pumped storage’ throws away generated power, but that power would have been thrown away anyway because each thermal power station is designed to provide an output of electricity. It can only provide very little more or very little less than this output (i.e. a power station has a “low turndown ratio”). The energy that would have been thrown away during times of low electricity demand is used to pump the water of the ‘pumped storeage’ system. Thus, ‘pumped storage’ reduces the need for a few power stations to operate almost continuously on standby mode so they can supply electricity at times of peak demand. …Hydrogen in it’s ionized state are merely swimming protons. They can migrate through all containments. H2 is much better, but still extremely problematic. I agree, natural gas can transport in a hydrogen designed system, but hydrogen cannot transport in a natural gas designed system. H2 is still a big problem. It’s just not practical to store significant quantities of H2 for significant amounts of time. Unless someone comes up with the super-hydromatic storage system we’re never going to be running our cars or planes on H2, excepting some baffling drones. Fix it into ammonia? Maybe. Some have suggested using that as the true storage medium. A chemist would have to comment on the practicality of that. Electrolysis also has efficiency problems. 25% was a number that stuck in my head but simple googling suggests maybe it’s 50%. Still not great. Many of life’s ironies are controlled by a small number of pieces of crucial information. In the case of wind farms not meeting the expected percentage of generation capacity as promoted by the political classes usually comes from the sad fact of the politicians failure to understand that an average is not a real thing but a wholly artificial construct. Because most politicians have not yet grasped that an average is not a real thing, they cannot understand that averages derived from real measurements can lead us to believe other stuff that is not real. By working out the average of wind flows in a particular place being assessed for the suitability of wind turbines, the statisticians have made their first huge mistake – average wind speed does not exist in reality and is therefore irrelevant. What matters is the frequency with which the wind blows at the speeds that can be used to safely rotate a turbine. Any other measurements are merely a trip into the realms of unreality and this has caused wind farms to be such a failure. The wind flow over turbine blades is rather similar to the three plates of porridge Goldilocks found; only one plate of porridge was ‘just right’ for her. Erecting wind farms in locations which have high average wind flows is pointless. Erecting a wind turbine on a site where the wind usually arrives at gale force is as pointless as erecting one in an area where the wind rarely blows at all. Another interesting fact about averages that most politicians seem unable to understand is that half of any population must be, by definition, below average on any measure; the other half of that population must be, by definition, above average on the same measure. Which is why the spectacle of politicians calling for the raising of the ‘average performance’ of students taking a specific annual examination in the state schools they control, as an example, is so sad. And they do it constantly. Very little wind today where I live in the UK – calm at ground level and about 10mph at 2000 ft. I noticed the local wind farm (who doesn’t have a local wind farm these days?) weren’t turning for a while. Just then, one – only one – of the turbines began to turn. I strongly suspect this is one of those examples of the turbine drawing power from the grid to make it turn for engineering reasons. I kept seeing the long amortization periods and tried to imagine how these devices would last longer than a roofing tile without periodic upkeep .. which costs more.